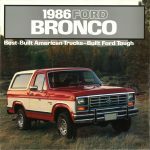 The Ford Motor Company will debut a new Bronco in 2020, after a 24-year absence, and that model name — used from 1966 to 1996 — still holds great appeal. 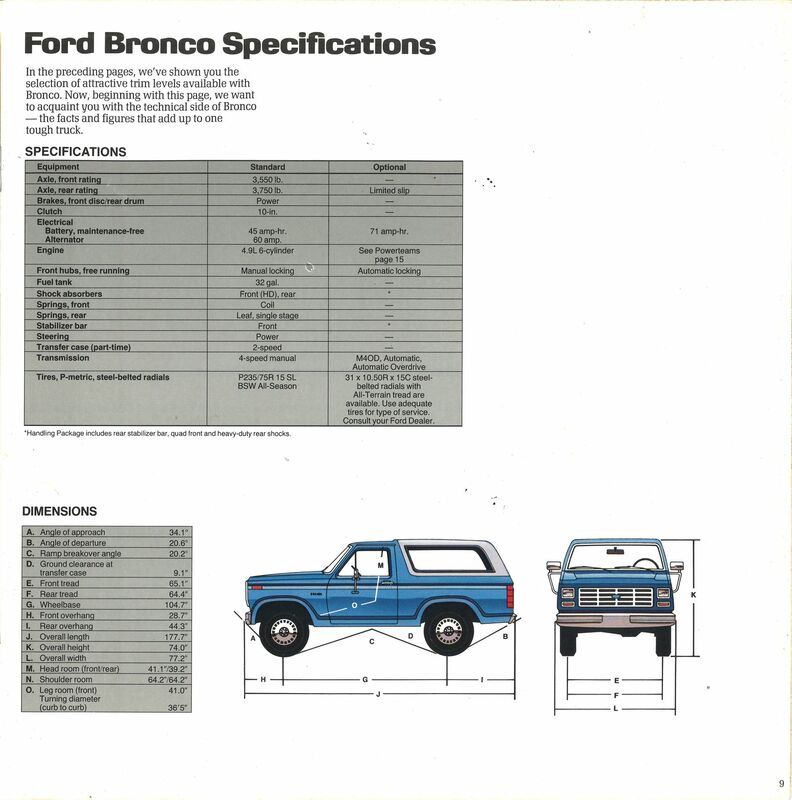 The original Bronco 4×4, which debuted in the fall of 1965, entered its second generation for 1978, when it was moved up to the fullsized truck platform. 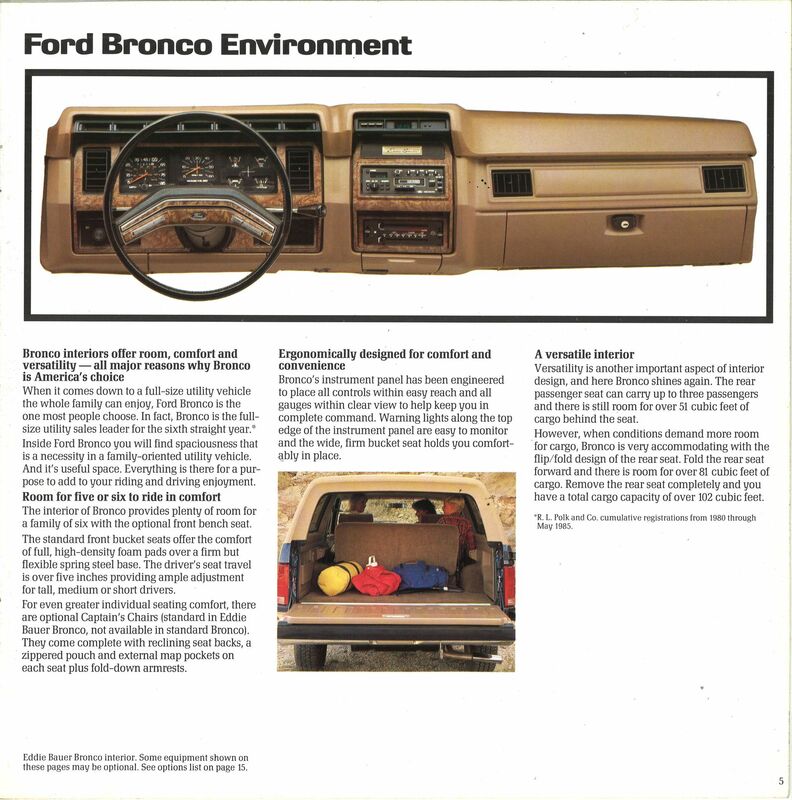 Just two model years later, it was redesigned again, and starting in 1987, the fourth generation was marked by flush headlamps, while an aero-styled facelift and fresh interior would see the fifth-generation Broncos out, from 1992. 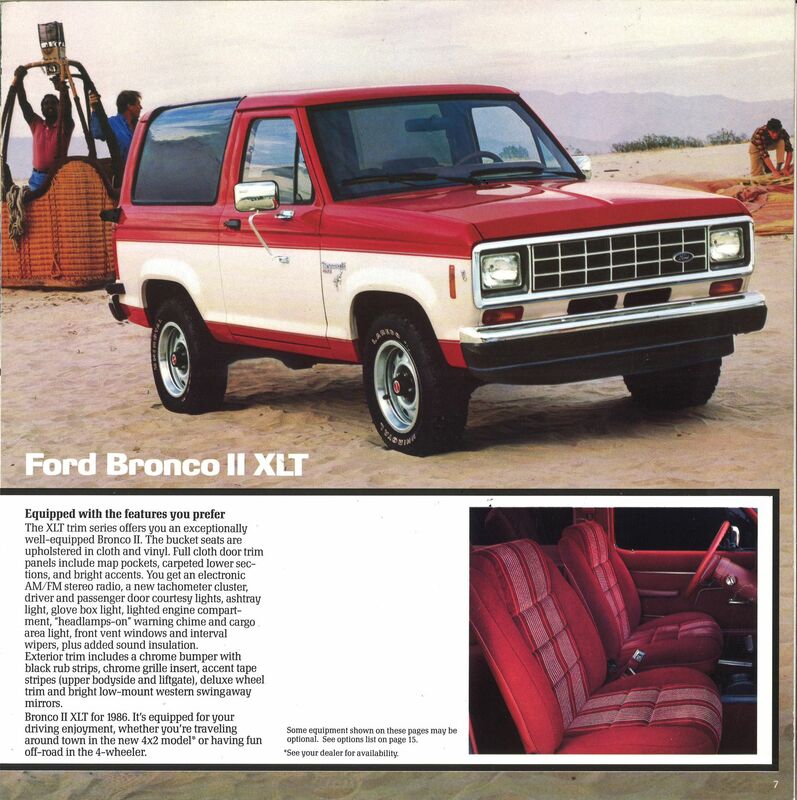 By the end of its run, this model would have a standard fuel-injected 302-cu.in. 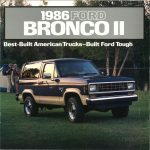 V-8 engine or optional 351, a five-speed manual or four-speed automatic, auto-locking hubs, four-wheel anti-lock brakes, and a driver’s airbag. 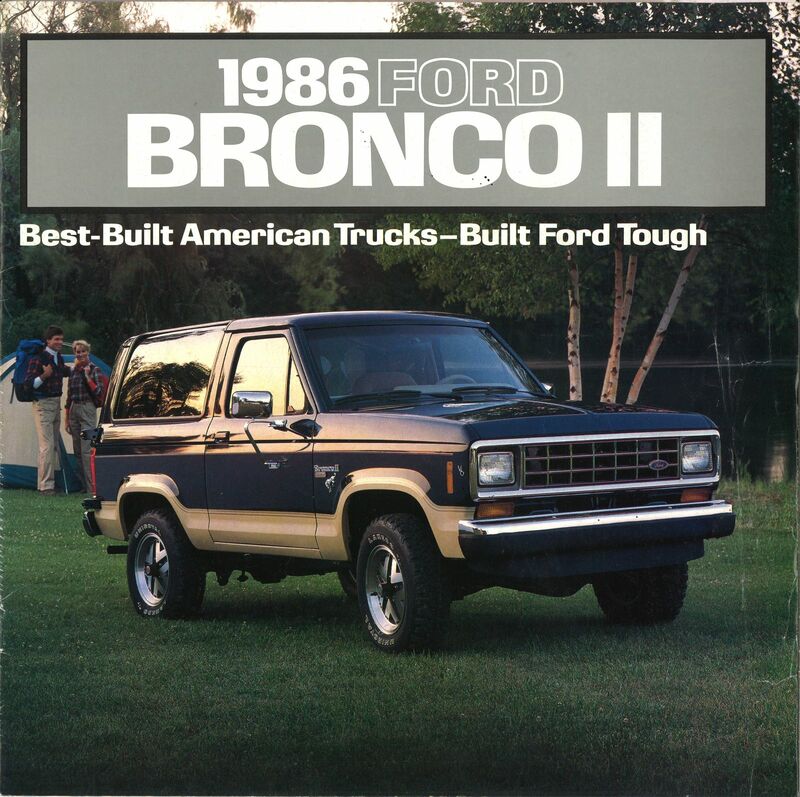 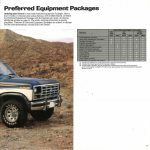 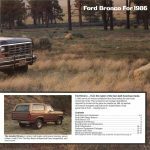 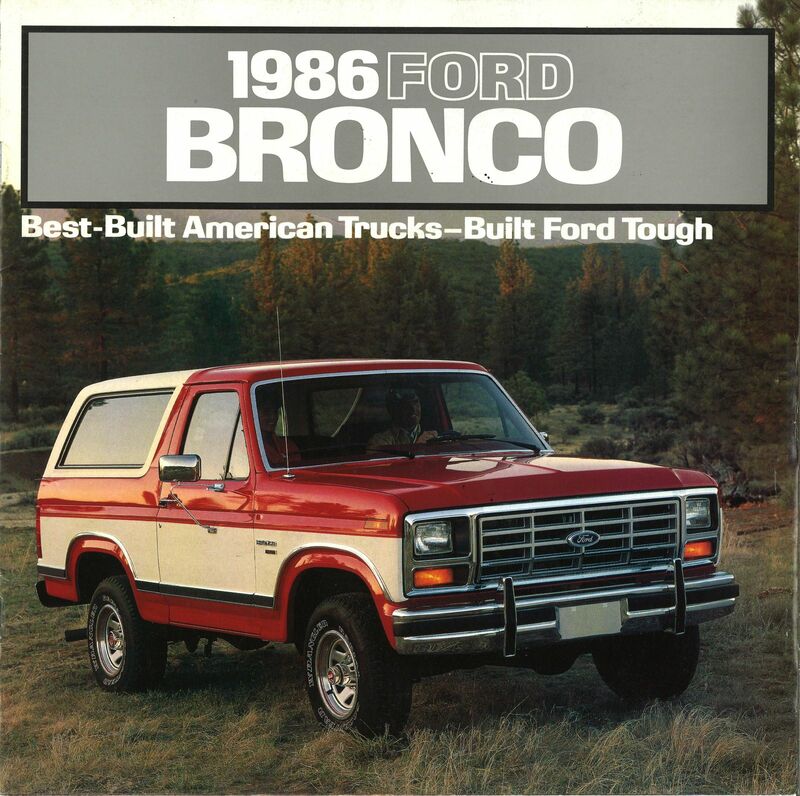 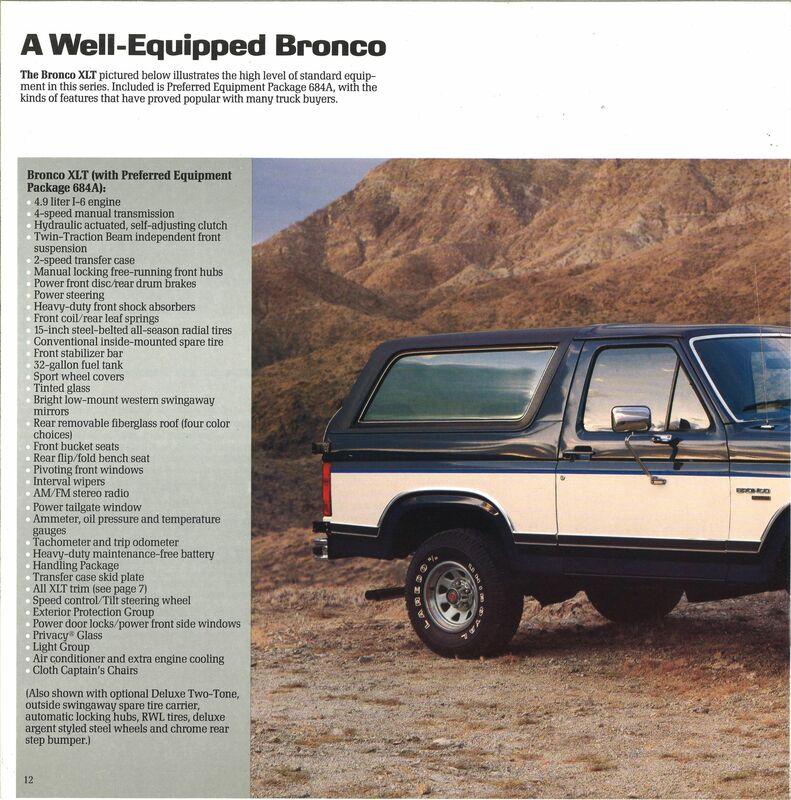 Back in 1986, the fullsize Bronco was still selling well — its base price was $12,782, or roughly $29,340 today — with 57,448 going home with buyers. 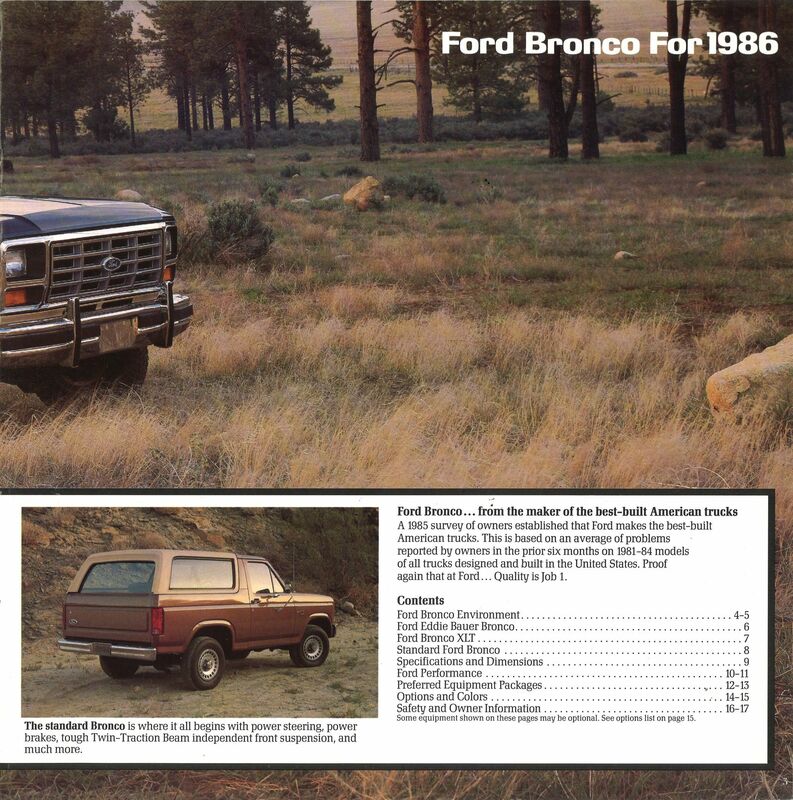 The bulk of those (65.9 percent) were built with a 190-hp, 302-cu.in. 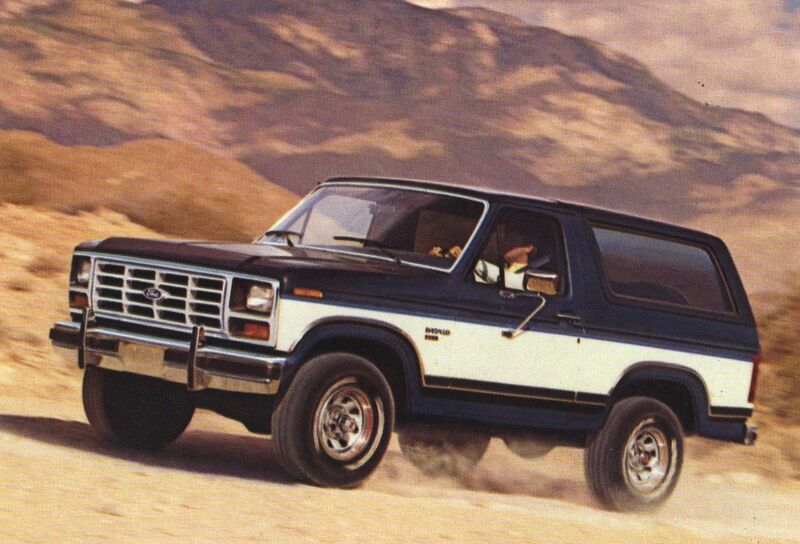 (5.0-liter) V-8, with 22.1 percent opting for the top-dog 210- hp, 351-cu.in. 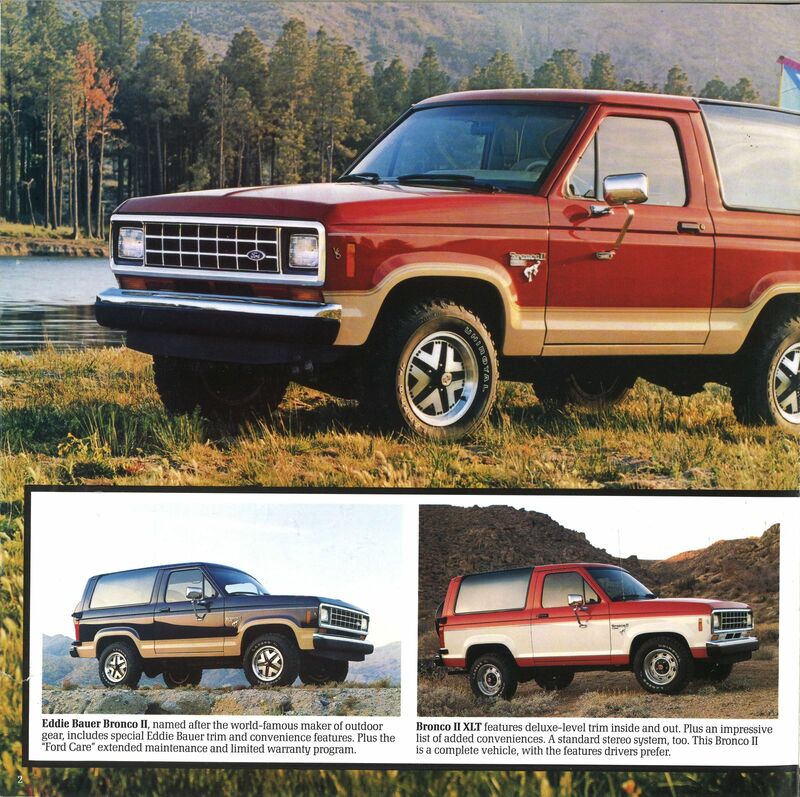 (5.8-liter) V-8, and just 12 percent taking the base 115-hp, 300-cu.in. 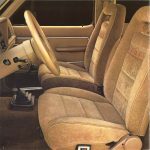 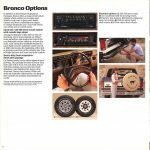 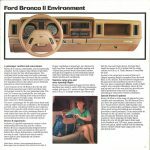 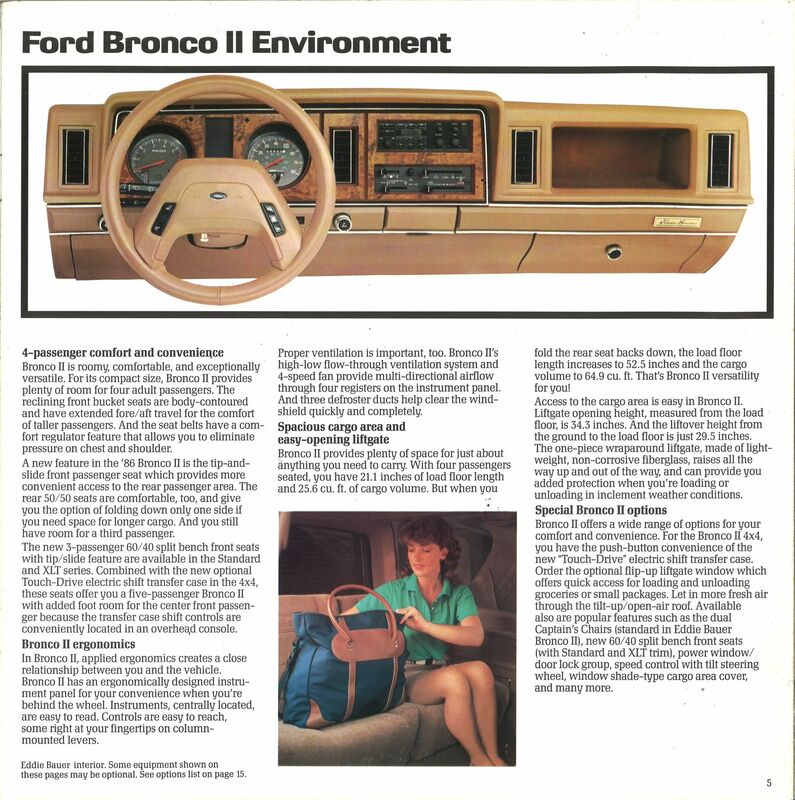 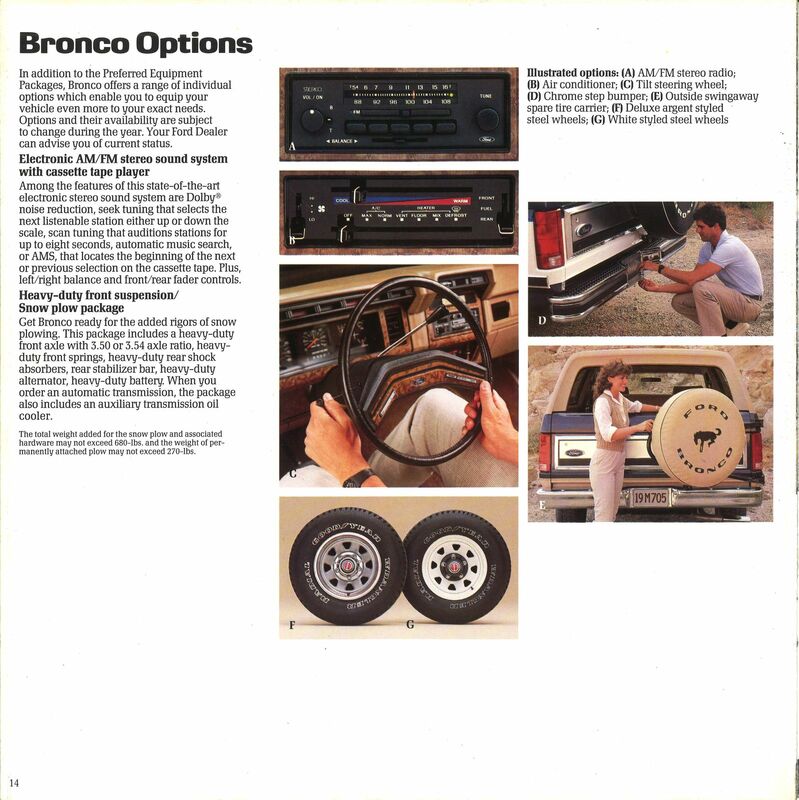 (4.9-liter) I-6; 88 percent of 1986 Broncos were built with the Automatic Overdrive transmission, leaving just 12 percent shifting a four-speed manual on their own. 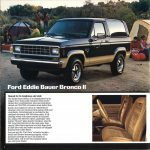 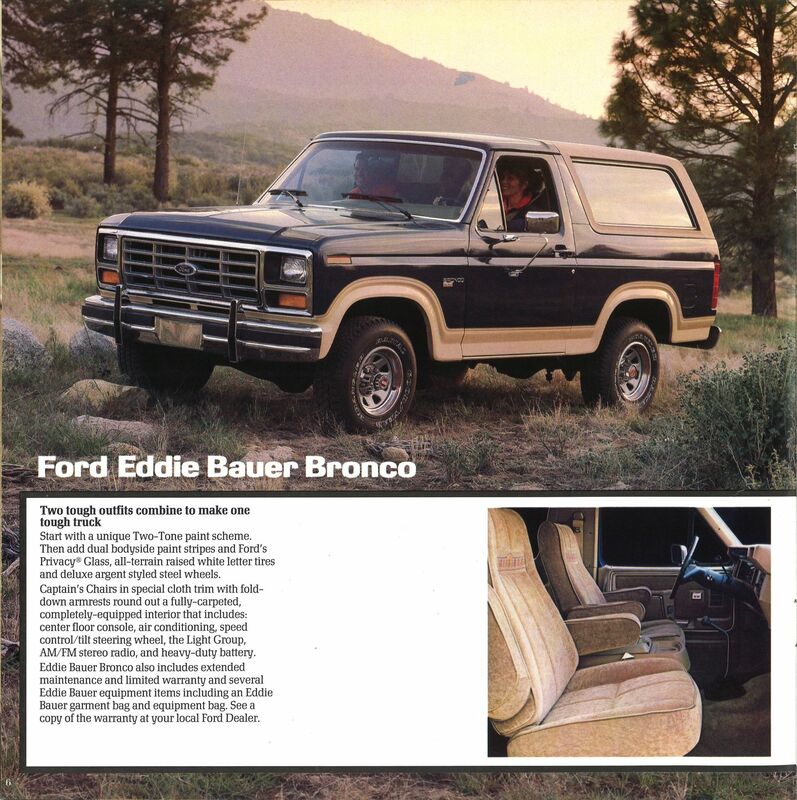 The most coveted variant that year would be the posh Eddie Bauer Bronco, with its special two-tone paint, privacy glass, bucket seats (“Captain’s Chairs in special cloth trim with fold-down armrests”), and more… including Eddie Bauer garment and equipment bags. 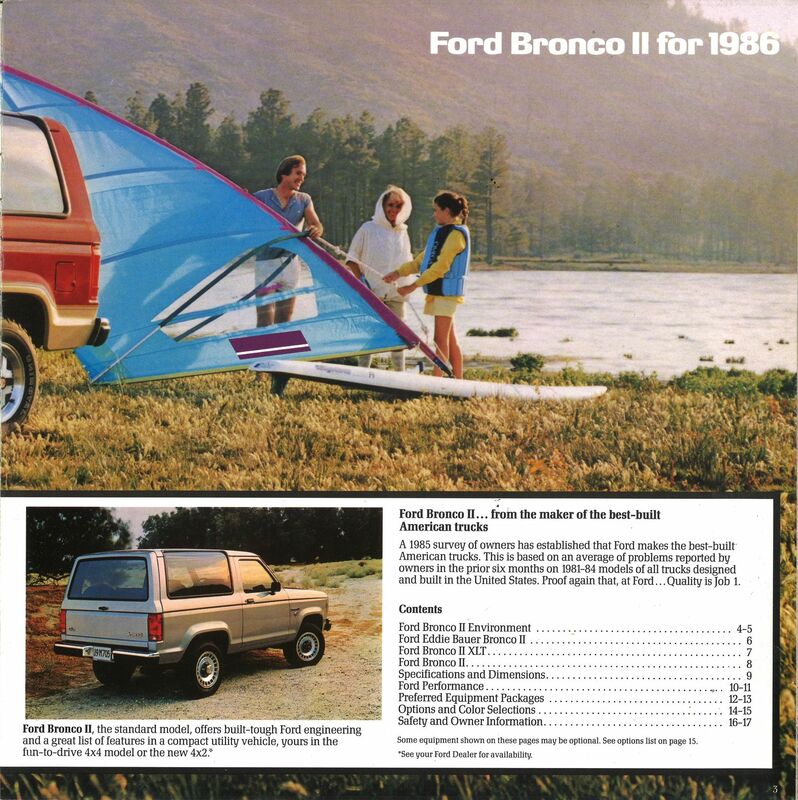 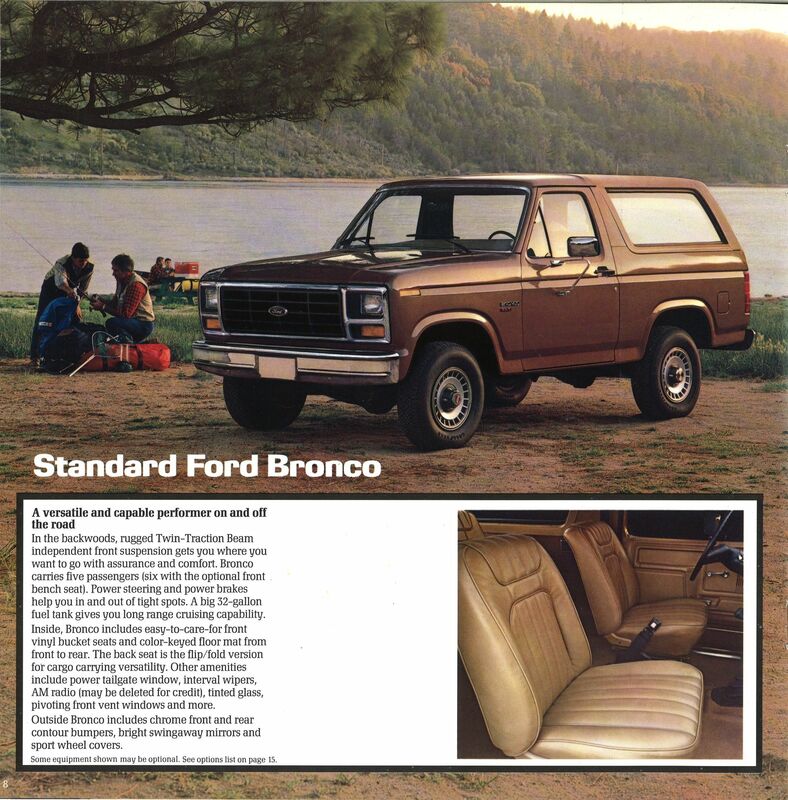 Ford had the SUV market covered that year, as it also offered the smaller Bronco II. 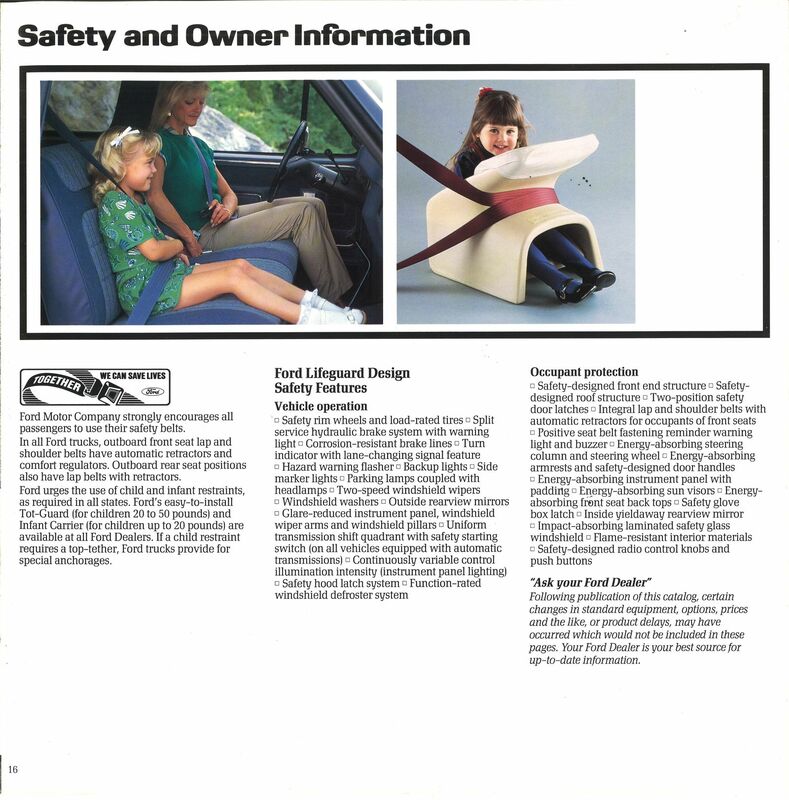 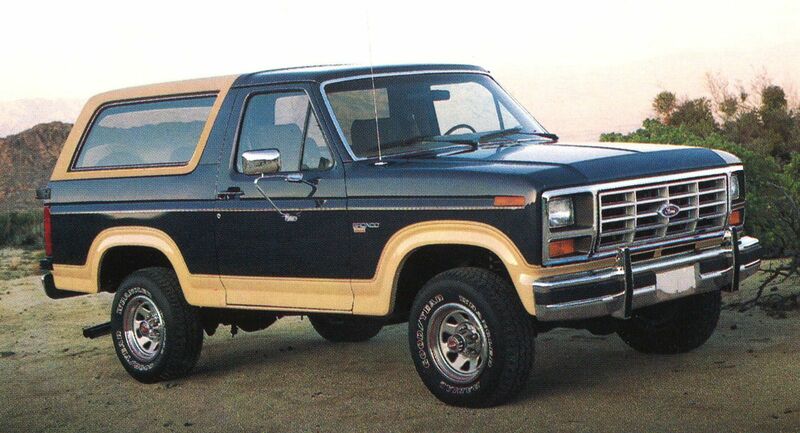 This solid-roof two-door had been developed alongside the compact Ranger pickup, and debuted for 1984. 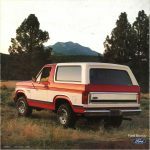 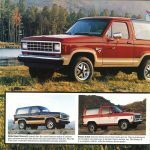 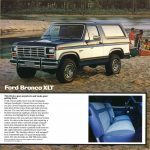 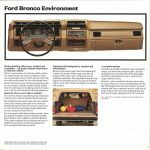 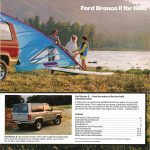 For 1986, the four-passenger Bronco II was powered by a newly fuel-injected 2.9-liter V-6 engine that replaced the carbureted 2.8-liter V-6 used the two previous seasons; both were German-built “Cologne” engines. 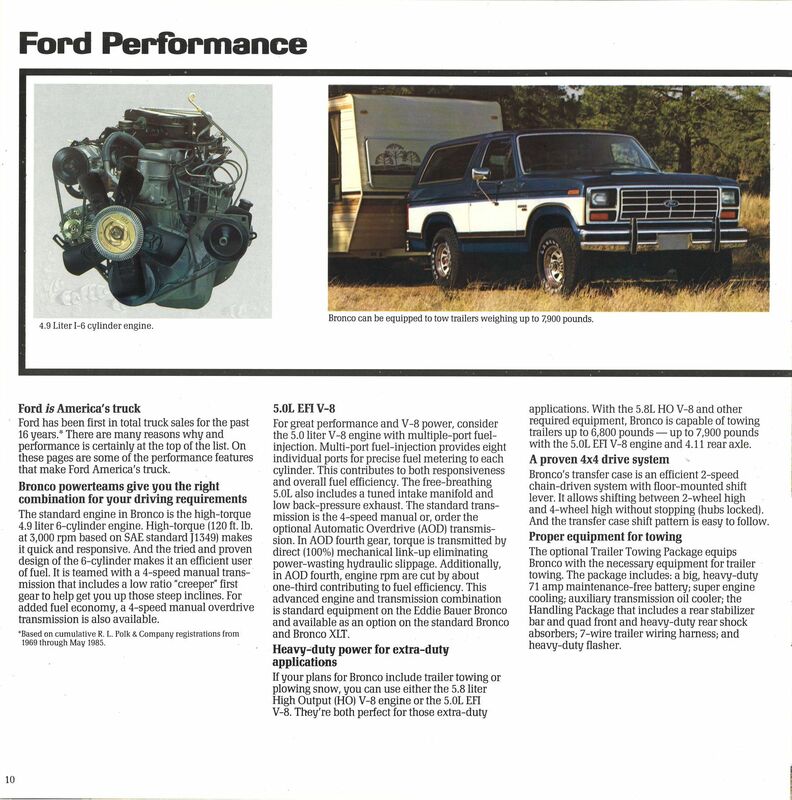 That new computer-controlled multi-port EFI system was said to offer improved fuel economy and performance, not to mention a real boost in power, with 140 hp handily topping the older engine’s 115-hp output. This truck’s manual transmission had five forward gears, while the Automatic Overdrive included four. 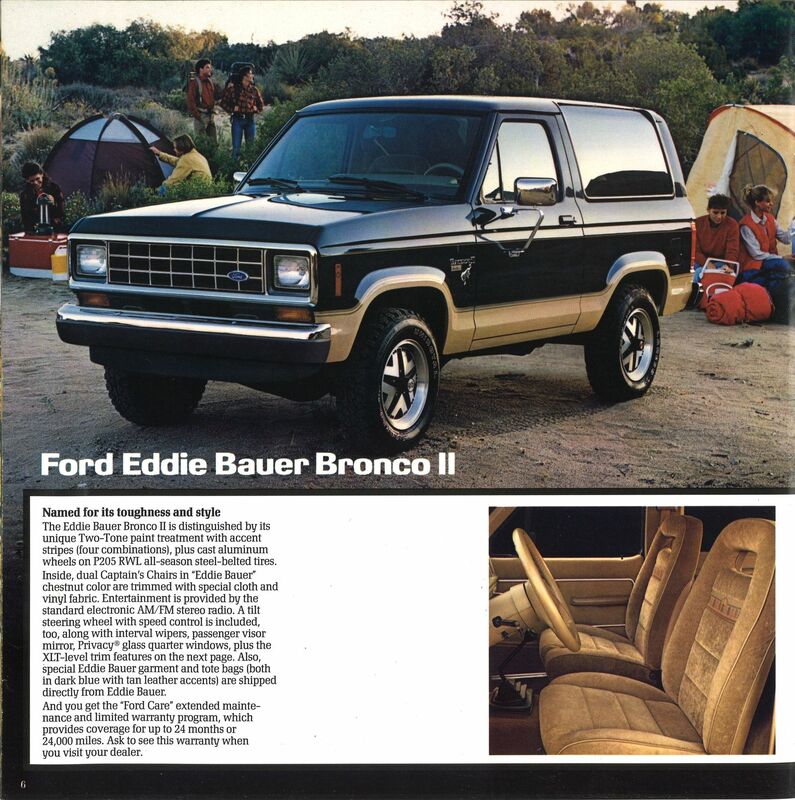 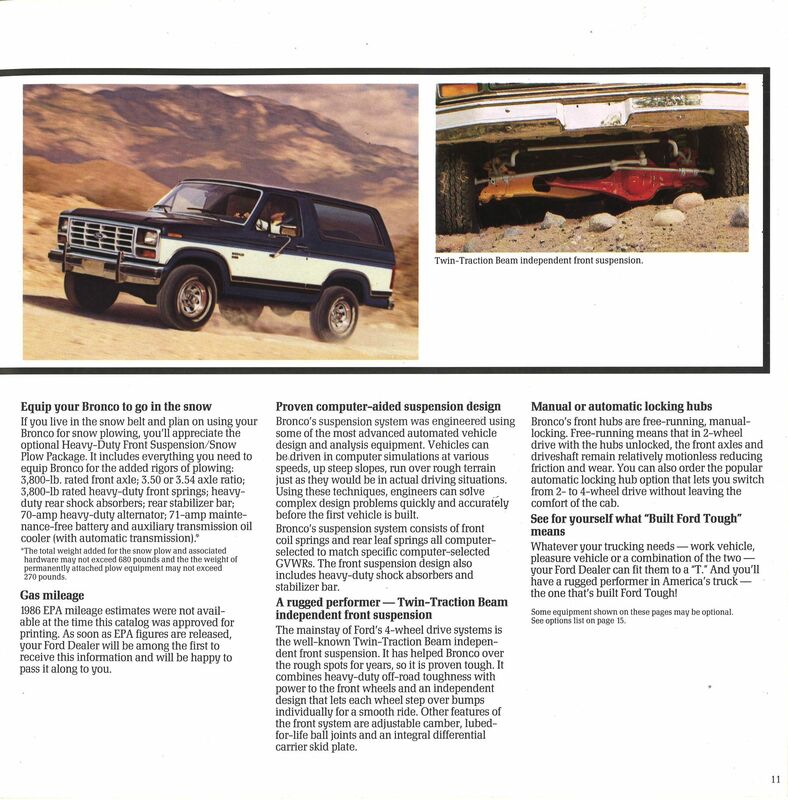 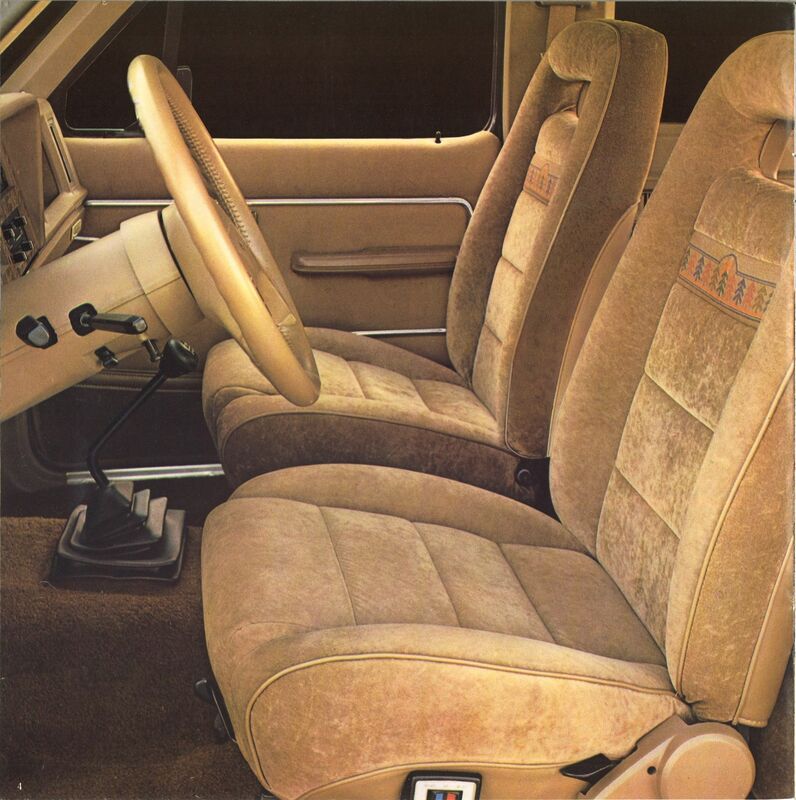 Like its big brother, the Bronco II could be had in base, mid-level XLT, and premium Eddie Bauer trims. 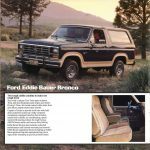 A new 4×2 (RWD, costing $10,279/roughly $23,635 in today’s money) version was offered for buyers more interested in economy and on-road comfort than back-country exploring. 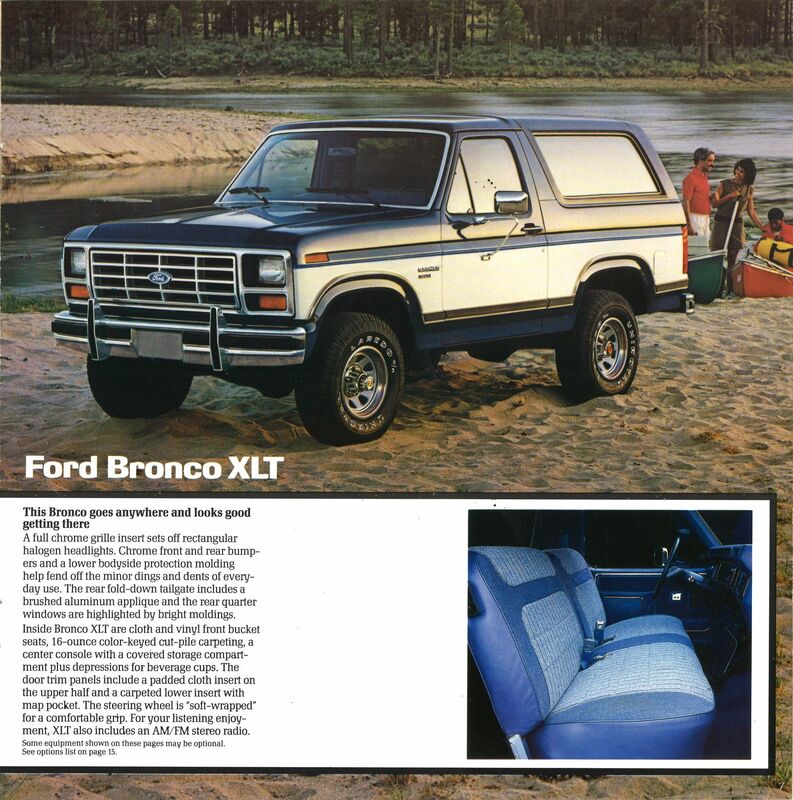 The 4×4 ($11,501/~$26,445) version used a standard part-time, manually shifted two-speed transfer case, with “Touch-Drive” electric auto-locking hubs available. The Bronco II was very popular for Ford, with 109,875 units built for the 1986 model year. 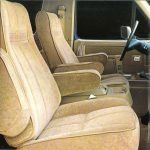 More buyers opted for the automatic (60.1 percent) than the manual (39.9 percent) transmission, but most chose creature comforts in the form of air conditioning (75.2 percent), cruise control (67.2 percent), and a stereo (81.2 percent). 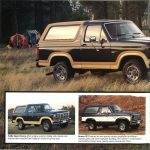 The SUV market was changing by the early 1990s, when popular four-door competitors like the Jeep Cherokee and Grand Cherokee and Chevrolet’s S-10 Blazer and Tahoe, were becoming the choice of families. 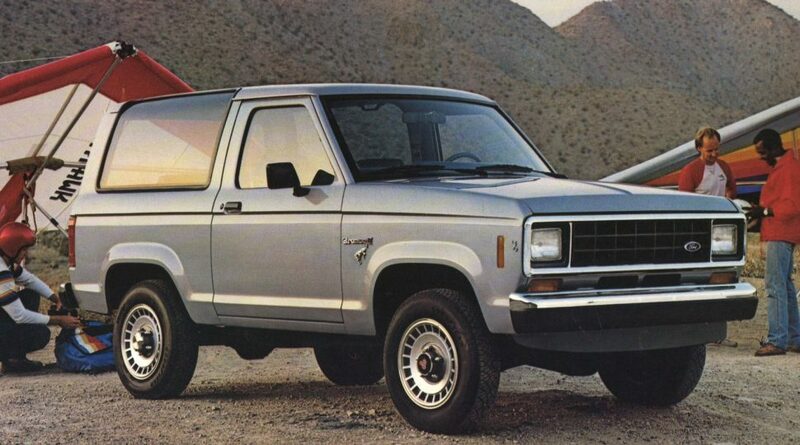 The Bronco II was the first to fall victim to this, being replaced for 1991 with the incredibly popular Explorer (which was initially available in both two- and four-door forms), and when the big Bronco was axed after 1996, its replacement was the up-to-nine-seats Expedition. 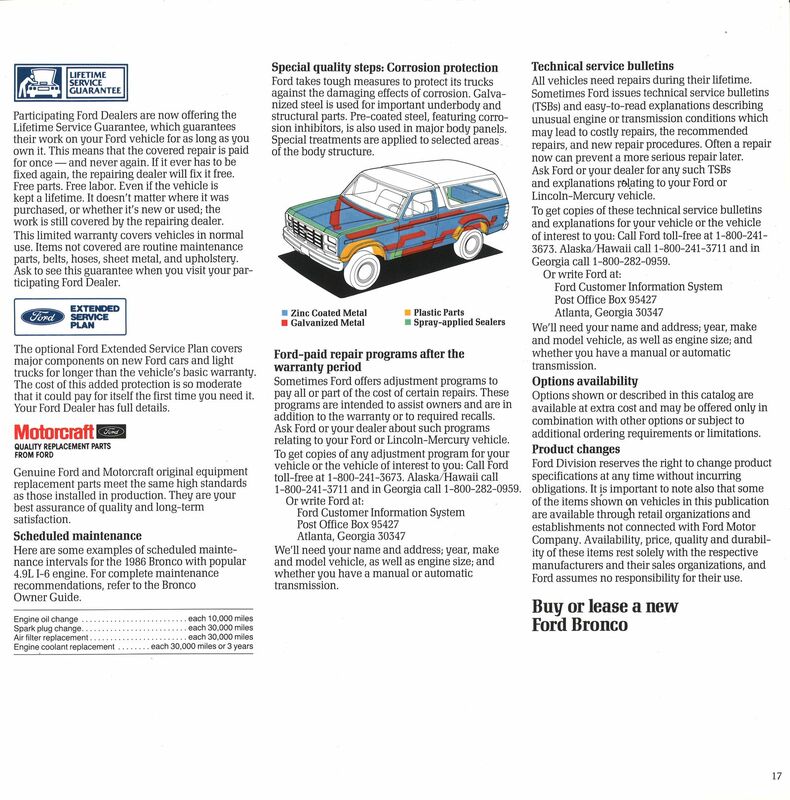 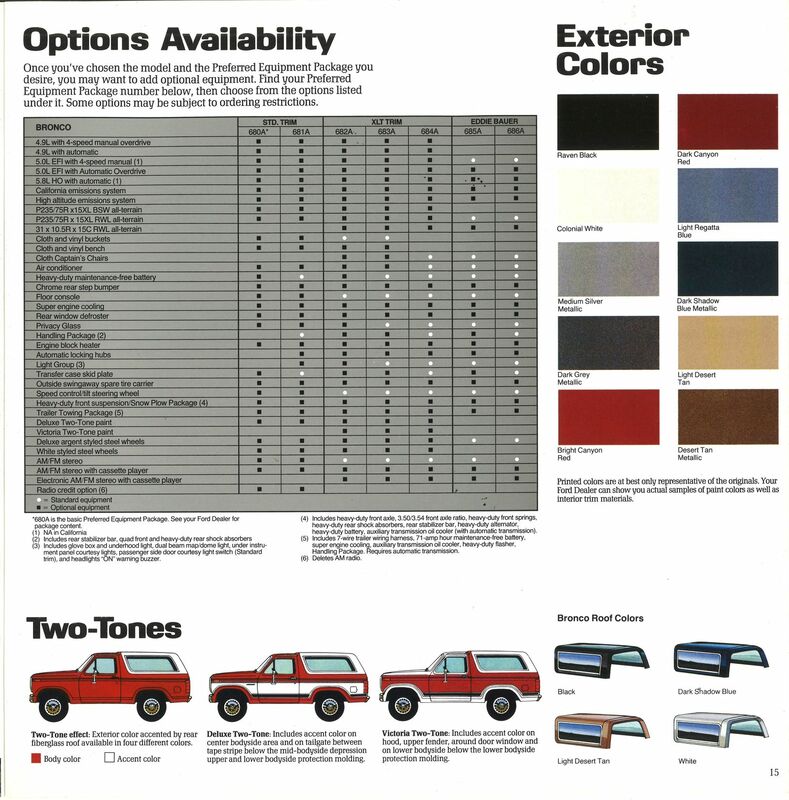 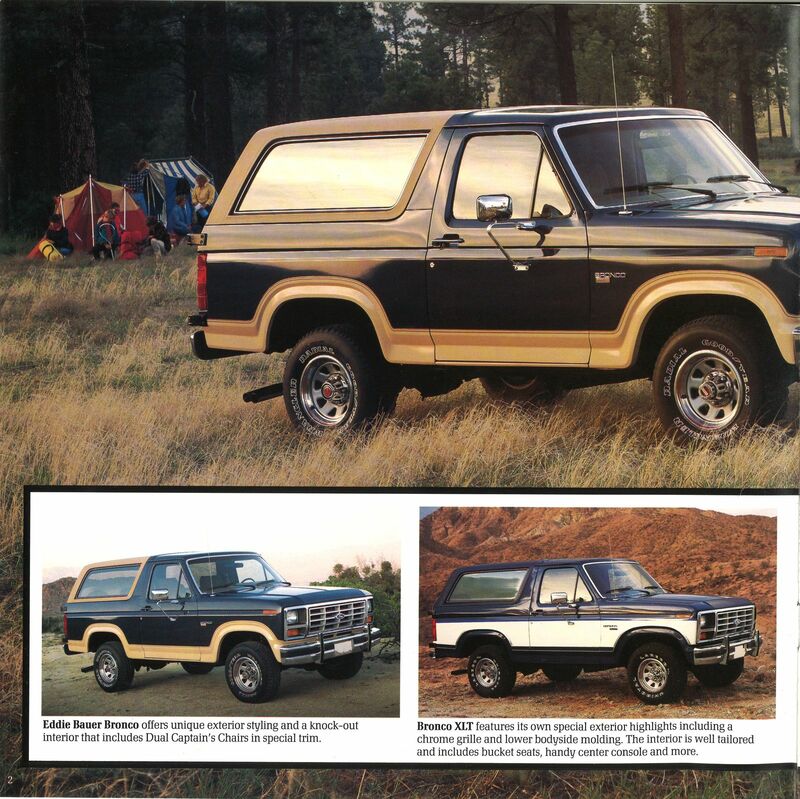 If you were in the market for a new Ford truck in 1986, which of these would you choose, and how would you spec it?